Two "Sandown" class minesweepers were in the Oban area on 27 September 2008. HMS Bangor (M109) lying at the North pier. 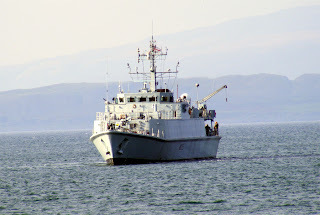 HMS Penzance (M106) lies at the Western entrance to Oban Bay awaiting the transfer of personnel from Bangor. She had quite a wait! (see next thread).